During this mass migration, orphaned and abandoned children were taken out of New York City via "baby trains", later called "orphan trains". Over a 75 year period, c. 1854-1929, it is believed that as many as 300,000 children were relocated this way. Hollis Canham of the Orleans County Genealogical Society will tell us this fascinating story. Please register online or call 617-6181. Saturday, March 29th at 2:00 pm. Fannie Barrier, an 1870 graduate of the Brockport Normal School, was a speaker, writer and activist for civil rights for African Americans and for women generally. She was an associate of Booker T. Washington, one of the only women speakers at the 1893 Columbian Exposition, and she helped found the NAACP. In her old age she returned to Brockport and lived there with her sister until her death in 1944. This talk by Charlie Cowling of The College at Brockport will look at Fannie’s life, her growing up in Brockport, her career, and subsequent return to the local area. Please call to register. 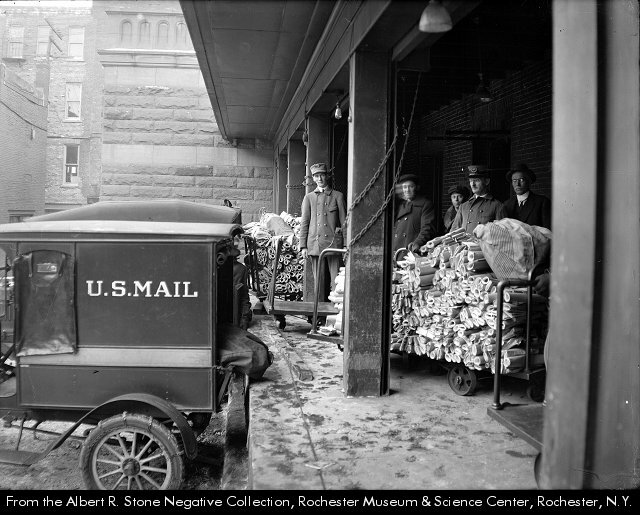 Our Regional Archivist, Dr. Preston Pierce, will help us explore the growth and development of the postal system in the Genesee-Lakes Country region. This illustrated talk examines the expansion of the postal service including changes resulting from the development of new technologies (especially cameras and post cards) and the expansion of the population. Common postal documents can reveal local history information that might be otherwise “hidden”, so family historians are encouraged to attend! No registration is required. Join us for this library program on Monday, October 28th at 7:00 pm. Drawing upon confidential hospital archives, private letters, and newspaper accounts, author Michael Keene will take us behind the scenes of his book, Mad House. Terrible secrets and haunting stories from our state’s history. Exciting, true, and scary! Registration is required and begins 10/7. Please call 617-6181 to register.